When we had purchased our tickets to the Old Masters Gallery, we noticed that they also came with entry to the Mathematics Gallery and the Porcelain Gallery. Not wanting to miss a single thing in this spectacular city, I headed across the Zwinger, to spend the rest of the afternoon, in the sparkling galleries of the Porcelain Gallery. The Porcelain Gallery is easy to find. It is right underneath the glockenspiel that rings in the Zwinger every hour. The bells on the outside are also made from the same famous porcelain that is on display inside the gallery. 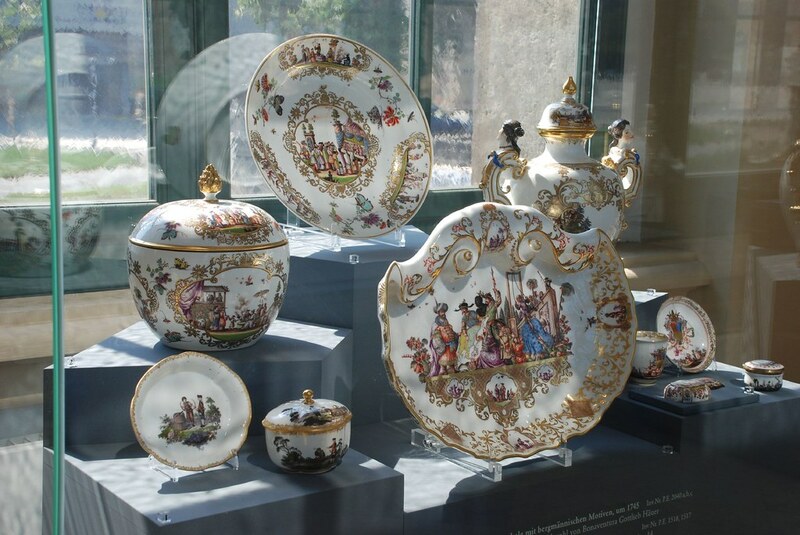 The Porcelain Collection was established in 1715 by our favourite Dresden hero, Augustus the Strong. Augustus was a collector and his interest in porcelain exploded in the 17th century after a visit to China. The Dresden collection is the most exquisite, and also the largest, specialist ceramics collection in the world. There is nowhere else on earth where you can stroll through galleries of hundreds of pieces of world-class porcelain and also observe the stunning baroque courtyard through the wonderfully gilded windows of the Zwinger palace. 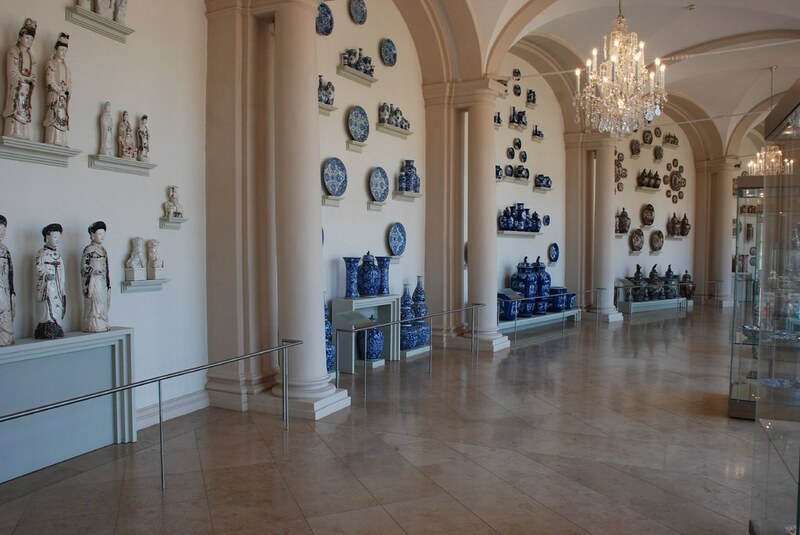 Over 20,000 porcelain pieces are housed within these walls. Augustus the Strong was obsessed with the porcelain, they even referred to his addicted as Maladie de porcelain and often he was heard to refer to the stuff as “white gold”. Long after his death, his family and those who oversaw the gallery protected it with the same passion, and this is why all these delicate pieces managed to survive the bombing of Dresden. Thanks to their protectors, these pieces were hidden in safe keeping until the war was long over. One of the most iconic pieces in the gallery is the Dragoon Vases. These were made famous after Augustus the Strong exchanged a regiment of dragoons for this set of porcelain from the Ming and Qing Dynasty. They are classic white porcelain accented with that bright blue engravings. But Augustus wasn’t happy having to wait for this collection to be filled from China, we wanted a porcelain factory right there in Saxony. So in 1708, Johann Friedrich Böttger and Ehrenfried Walther von Tschirnhaus helped establish the first porcelain factory in Germany, in Meissen. 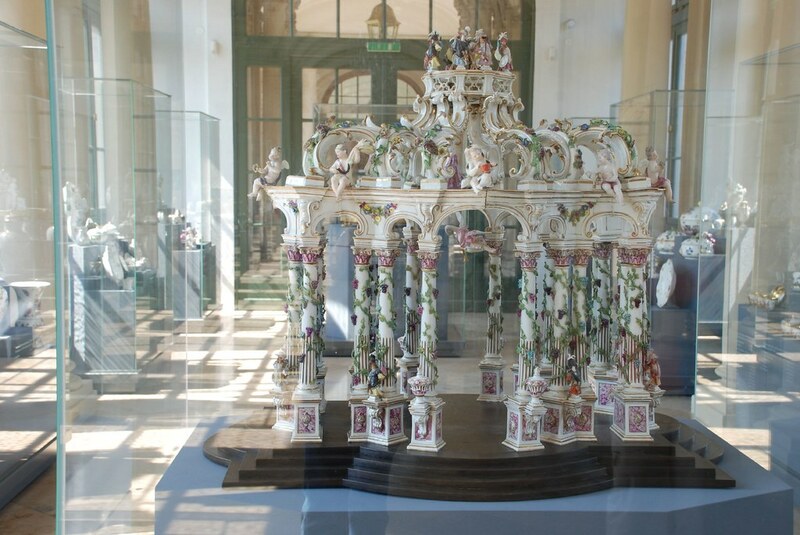 Meissen went on to be one of the most sought after kinds of porcelain in the world. In 1850, there were over 200 decorating studios in Dresden, painting the various creations made from the porcelain factories. From these studios, there came a distinctive “Dresden” style of porcelain design. This was a combination of Meissen and Viennese style. Dresden porcelain was unique was they made their pieces by pouring liquid porcelain into plaster molds. This resulted in a thinner, hollow and lightweight final product and therefore was less costly to produce and less expensive to ship. 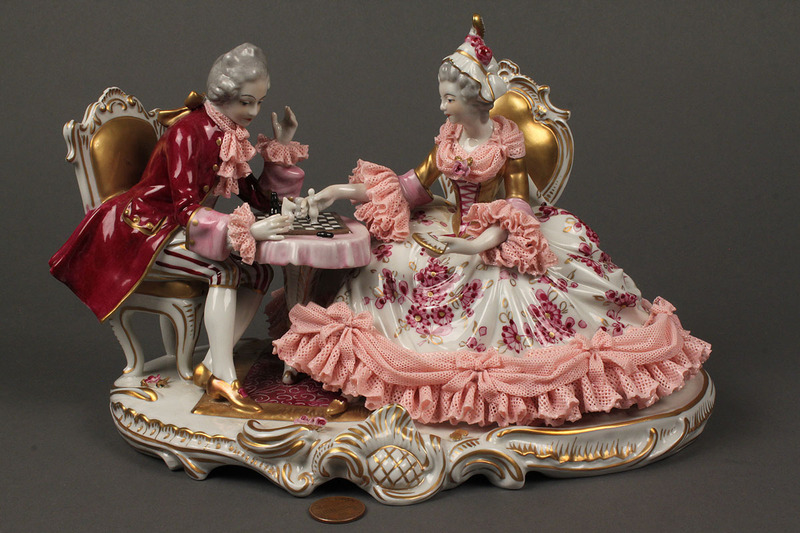 But what made the Dresden porcelain unique was their addition of lace to the figurines in 1770. Designers would add a small amount of lace around the collars or sleeves of porcelain figures. Then they started to create elaborate skirts and dresses as well. Dresden porcelain was also replete with flowers which adorned the gowns, hair and basis of these figures. The Dresden artists were famous for creating large group scenes, portraying life in court in the 18th century. In these scenes, elaborately dressed ladies dancing with courtiers and musicians played their instruments along side them. But Saxon porcelain wasn’t merely cute court scenes; They also created traditional pieces covered in mythology or Rocco drills. 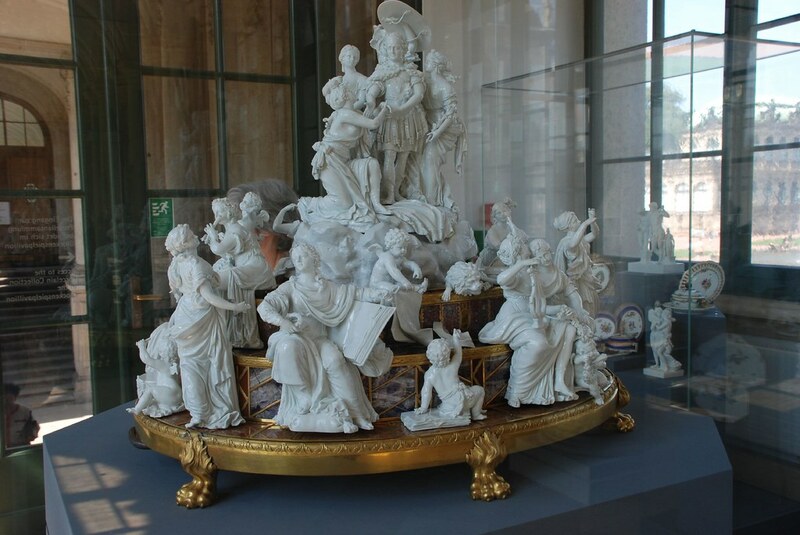 The Meissen porcelain makers also loved sculpture. This was a challenge for them, breaking out of making simple vases or small porcelain figurines. These were almost life size creations monkeys and lions, eagles and even a peacock. These are all now on display in the gallery, house in their special room dedicated to these creations. One of my favourite pieces in the exhibit was this HUGE gazebo scene. The enormous baroque roof, complete with cherubs peering down off the sides, is held up with these little columns, beautifully decorated with climbing vines and roses. Another one of the most interesting pieces in the gallery for me was the Vincennes porcelain bouquet. Vincennes porcelain was established in 1740 in the disused Royal Château de Vincennes, in Vincennes, east of Paris. The group of flowers is almost ethereal in nature, not humans hands could be so dedicated to creating this undying pieces of life is fantastic. The bouquet includes metal stems and foliage, and the flowers stand on a bright white porcelain base, decorated with the vase and two little figurines scenes on each side. One can only image looking after such a precious piece of porcelain. 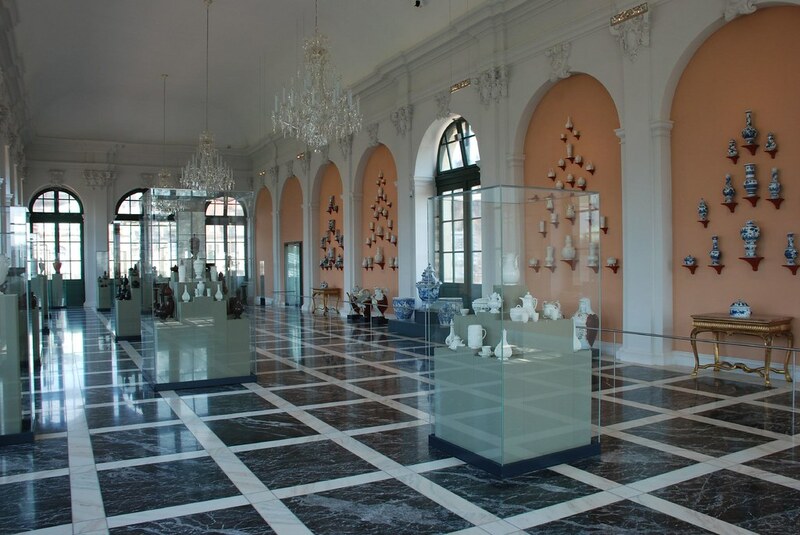 All in all, the Porcelain Gallery is an excellent collection, and a must see for anyone visiting Dresden. 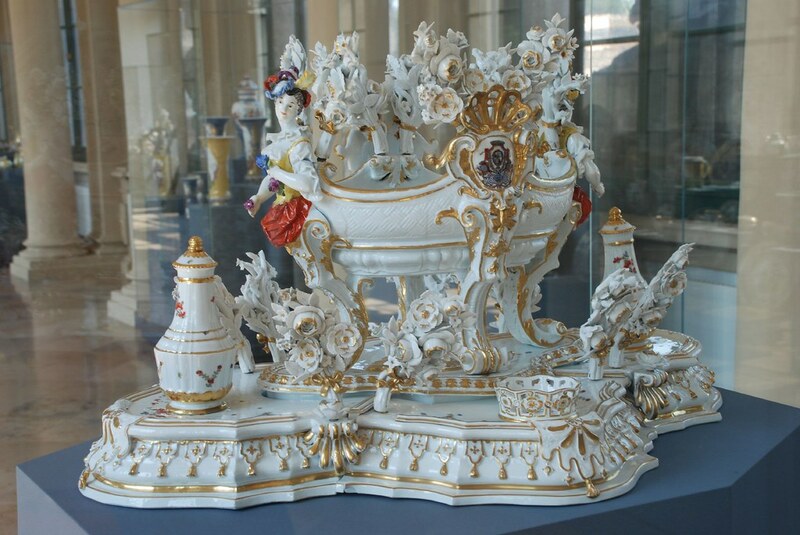 It not only is a visual stunner but also tells you a lot about the history of Dresden through Porcelain.